Yee-Haw! In commemoration of Toy Story's 20th anniversary this past fall (yes, it's been that long; feel old? ), the Disney Store released this fun tee for a limited time! This was only available during the week of November 16 through November 22, 2015. Though I ordered this during that time frame, it took over a month to come (looking back, the page did state that it would take an extra three to five weeks for delivery for whatever reason); so it wasn't actually too long ago that I received this in the mail. I was beginning to think it wasn't coming! I really loved the design of this tee when I saw it, so it was a must for me being the massive Toy Story fan that I am. All the iconic elements (the logo, the clouds, the Luxo ball...) combined with the big "20" is just perfect. Getting this tee for me was a fun way to celebrate such a big milestone! It's a great collector's piece as well. 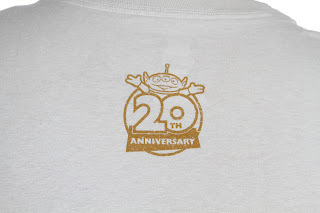 On the back of the tee, near the neckline, you can see the official Toy Story 20th Anniversary logo with the Pizza planet Alien (which is a nice little added detail). Another cool thing (that I actually hadn't noticed until tonight), is that it also says "Andy" (in Andy's signature backwards style) on the inside of the shirt near the bottom. Really cool stuff! Though this isn't in stock anymore, you can visit the original Disney Store page still HERE. Other than that, if you're looking to track this down, keep a look out on eBay. One's bound to show up there sooner than later! Best of luck.